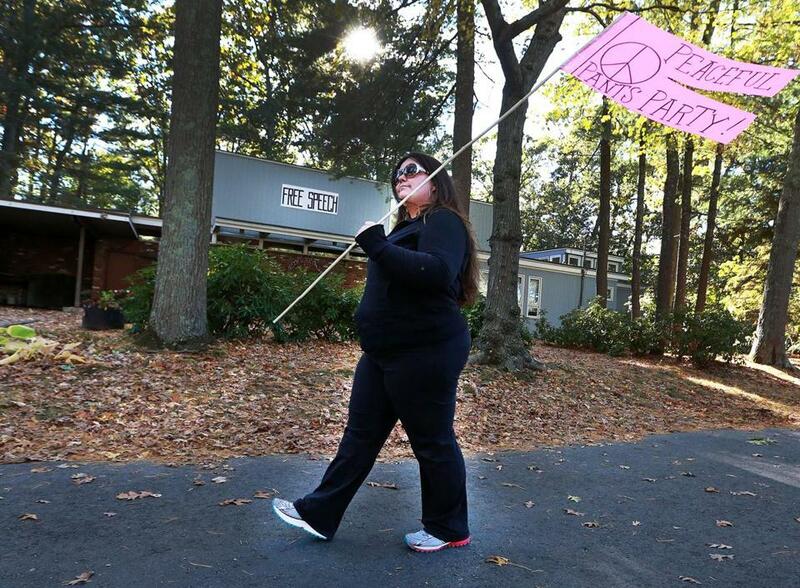 A group organized to parade past the Rhode Island house of a man who criticized women wearing yoga pants in public. 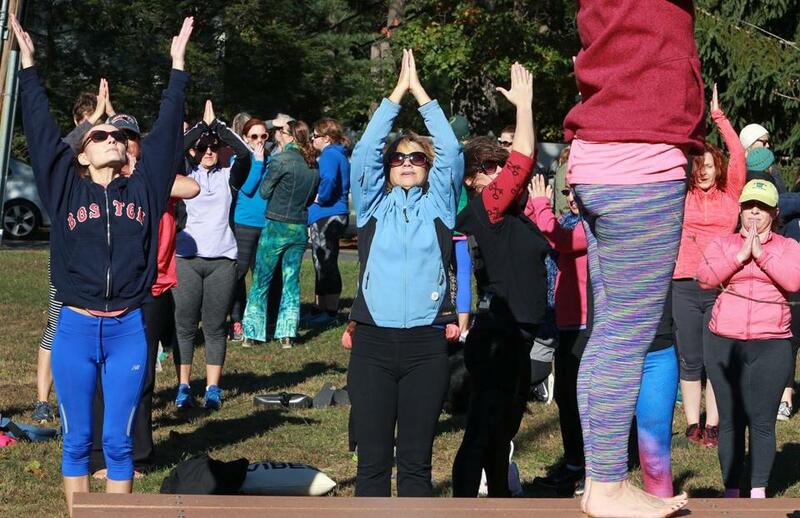 BARRINGTON, R.I. — The saga began Wednesday with a letter to the editor in a local Rhode Island newspaper criticizing women over 20 who wear yoga pants in public. 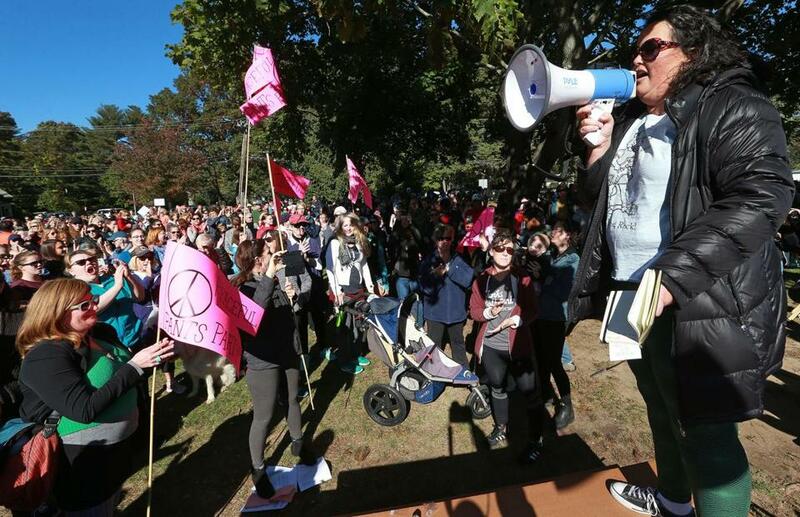 Quickly, it snowballed into a “Yoga Pants Parade” Sunday afternoon with hundreds of people walking past the letter writer’s house — and a few death threats, according to the author, who said he had only intended satire. The letter, which said adult women wearing yoga pants in public was comparable to men wearing Speedos to the grocery store, went viral. The backlash was immediate, passionate, and international. It was supposed to be funny, Sorrentino said, because what kind of “tormented, uptight individual” could possibly care enough about yoga pants to write such a letter? “It was in the face of all this political stuff, with all these really important issues going on, and then there’s this letter about yoga pants,” he said. 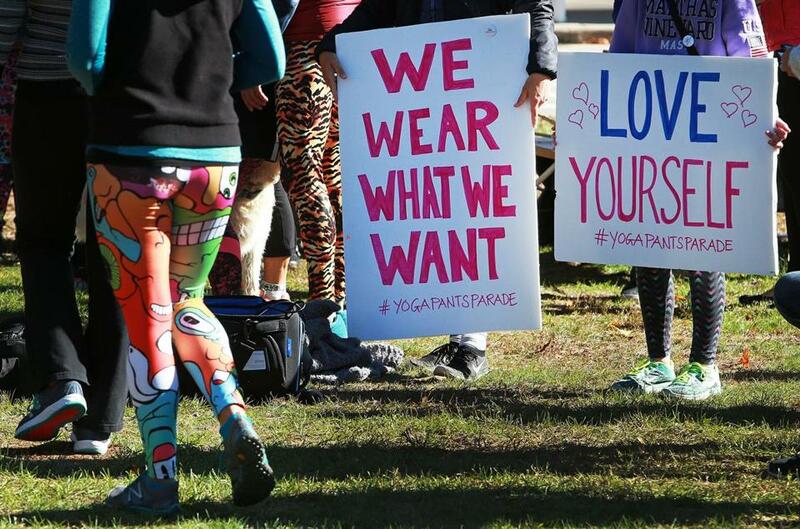 Hundreds of people on Sunday marched past the house of a man who said that women over the age of 20 shouldn’t wear yoga pants. Read: 2015: Yoga pants count as ‘business casual’ now? 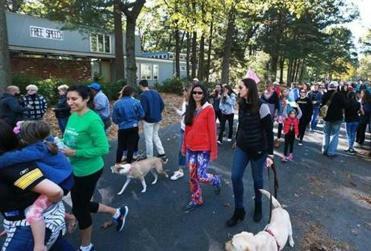 A crowd that included young girls and older women met in front of the Hampden Meadows School about 2 p.m., wearing a colorful array of yoga pants — although, as many attendees stated, the event was about more than just yoga pants. “I don’t get involved in much in the way of protests and marches and all of that, but this just brought me out because the guy’s letter was offensive,” said Ellen Taylor at the parade, who sported a neon yellow shirt with the words “ ‘MATURE OLDER WOMAN’ in yoga pants” written on it. “It’s OK if you’re 20 and gorgeous to wear yoga pants, but don’t do it if you’re older and lumpy and bumpy?” she asked. While not directly related to the presidential campaign, the rhetoric of the letter ties into the current political climate, Taylor said. Some marchers held signs as they waited for the march to begin. Barrington police officers stood on the edge of the property while some people in the street paused to take photos of the home. Sorrentino said he received death threats, which he reported to the police. Someone wrote in chalk on the street outside his house that morning, identifying him as the resident. The backlash has caused stress not just for him, but for his family, friends, and neighbors, said Sorrentino, who said his partner had decided to leave the home during the parade. The parade went past the house of Alan Sorrentino. “This is bullying,” he said. He asked whether a woman would feel comfortable with a similar crowd walking by her home after death threats. People from all over the world posted in the Facebook event with messages of support and photos of themselves wearing yoga pants. “Being in U.K., I can’t attend, but will share with my friends and will proudly wear my yoga pants this evening at the time of your parade,” wrote one poster. Well-wishers chimed in from Washington state, California, Missouri, North Carolina, and many other locations. • Has Bostonians’ addiction to casual dressing gone too far? • Yoga pants count as ‘business casual’ now? A letter to the editor by a man in Barrington, R.I., that criticized women wearing yoga pants spurred a response, which included a parade of women, and men, in yoga pants past the man’s house. A marcher carried a sign that read "Peaceful Pants Party." After the march, a short yoga class was held. Marchers at the yoga class. 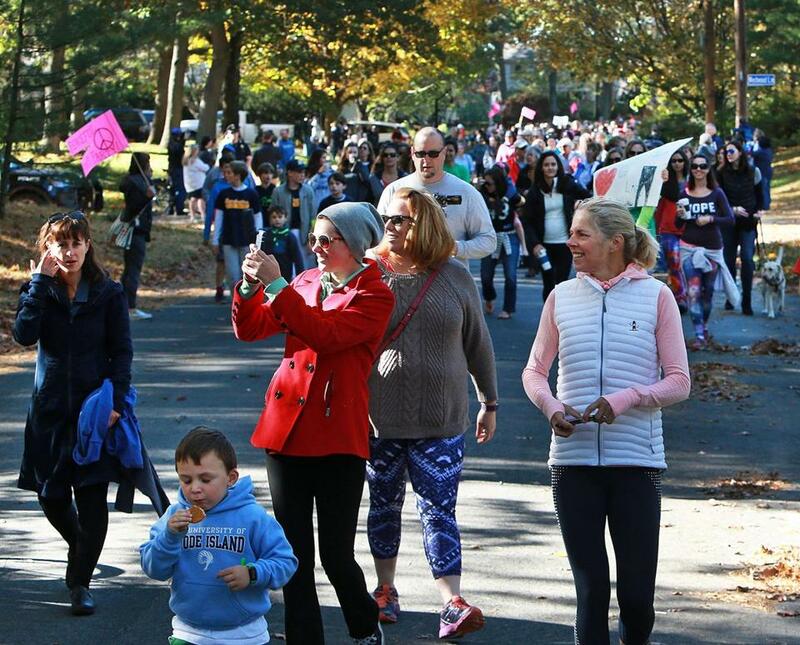 Camila DiMarco, who said she wears her yoga pants everyday, held a sign that read "I'm 53" in reference to her age as she waited for the march to begin.